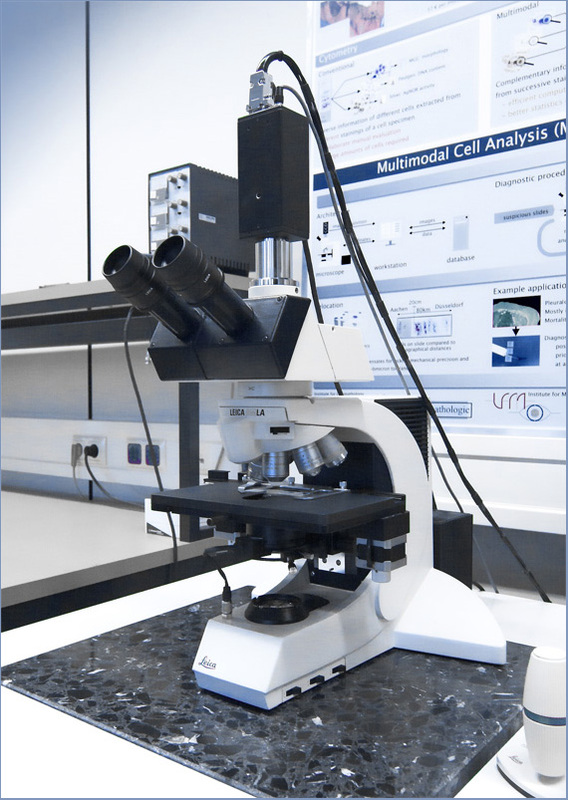 The microscopy hardware employed at the LfB lays the foundation for the development of a forward-looking digital microscopy workstation. The Leica DMLA is equipped with corrected objectives for high imgage contrast and a sharp, hardly distorted, chromatically corrected image. The light source, powered by a stabilised power source, facilitates a constant, hardly jitter-affected illumination of the field-of-view. A 3-CCD camera with large detector elements keeps the loss of quality during the image capture process marginal. All components were assembled with a particular focus on automatability. can be electronically steered as well. This enables, for instance, automatic white balancing or high dynamic range imaging (HDR). provide the basis of an ergonomic and efficient work flow. measurements that combines the analyses synergetically.